When people arrived at [In Good Company](https://www.bakerripley.org/get-involved/events/in-good-company), they were given a nametag – with someone else’s name. 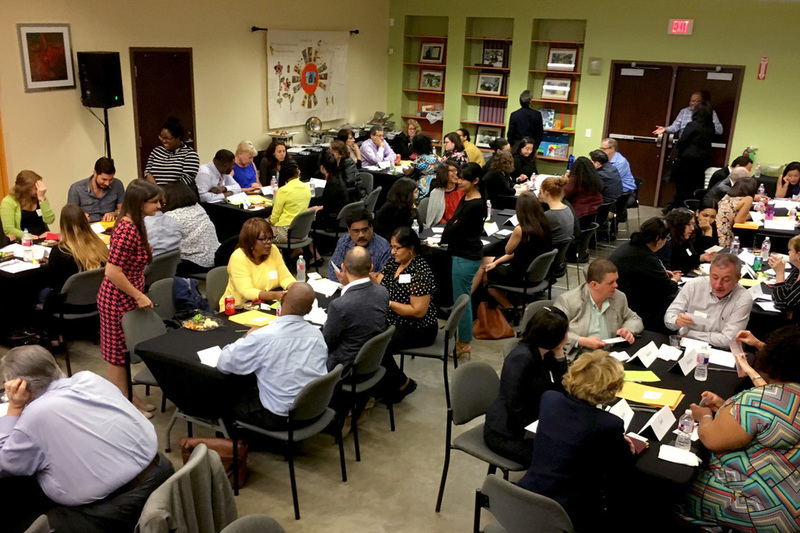 Every month we host a community gathering to discuss issues affecting Houstonians. In March, the focus was on immigration. When people arrived at In Good Company, they were given a nametag – with someone else’s name. This nametag, along with a sealed envelope, corresponded with the immigrant’s story they would be sharing that evening. Inside the envelope were cards detailing milestone years in an immigrant’s journey – a vital part in the game our participants would play. Jill Campbell, BakerRipley’s lead immigration attorney, gave a brief history of US immigration policy and explained how the game would work. What does it take to gain legal status in the United States? How long is the wait? How exactly does it work? Then the game began. Sitting in small groups, people took turns telling “their” story. Some cards contained action items where they had to roll dice to see if they could move forward towards their goal of becoming a legal permanent resident. Do they go back to their home country or stay in the US without documentation? Some people were moved to tears. If they were fortunate enough to make it all the way through their cards, they had to take the US citizenship test. This caused some concern and resulted in nervous laughter. Participants then took an actual citizenship test. They had to correctly answer 6 out of 10 questions, selected from a bank of 100 question options. One participant mentioned how he knew some of those answers, but the mounting pressure was all too real and he blanked – he couldn’t imagine basing his entire life off this test. The goal of these gatherings is to have meaningful discussions that leads to some sort of engagement. This month we wanted to strip away some of the myths surrounding immigration and show what we see on the ground every day to provide insight into immigration law and its impact on people’s lives. In Good Company is a community discussion that we invite you to join.